About - Plantworld Inc - Wholesale Subsidiary of Rowland Nursery Inc.
PLANT WORLD, INC. is the wholesale subsidiary of Rowland Nursery Inc. which was established in 1953. The Rowland family takes great pride in providing top quality plants and landscape products to the community they have been part of for over 60 years. 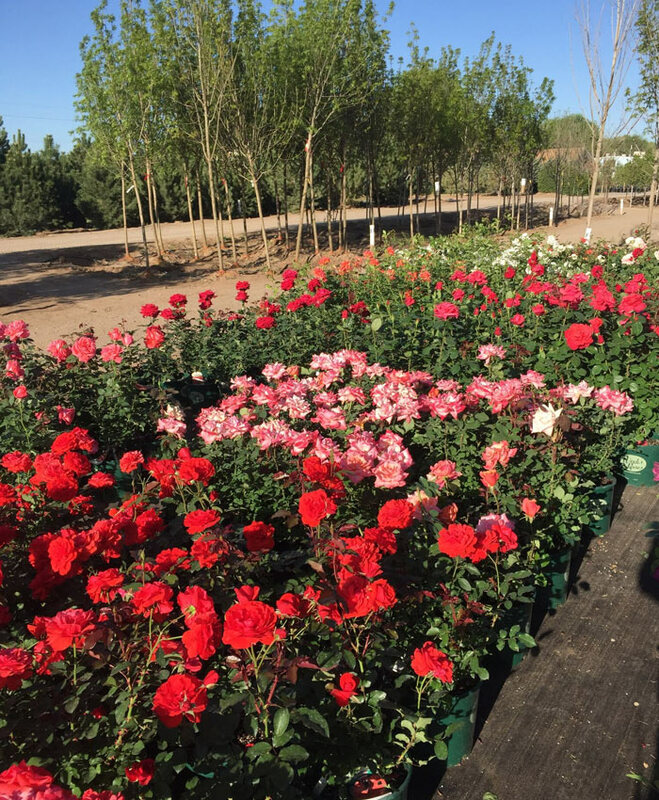 We are centrally located on 18-acres in the North Valley where literally thousands of flowers, shrubs, and trees from common to exotic specimens are available. We started the wholesale business on a simple premise: Be the horticulturalists that source, acquire and maintain the best quality plants, keep them available and ready for the landscapers so they can concentrate on doing what they do best, design and installation. Our buyers continue to seek new varieties and cultivars for the southwest. Rowland’s led the way in New Mexico introducing the largest Xeric and water wise plant selections in the state and continue to do so today. We take plant quality seriously. We acclimate our plant life to the southwest climate. Our plants are inspected upon arrival, fertilized and professionally maintained to ensure our customers will have the best rate of success when planted. We have national buying power with thousands of grower’s enabling us to meet the needs of the most discerning landscape architect, designer, landscaper. No project is too large or too small. Plant World has become the Southwest’s largest wholesale nursery. Founders Pat and Reba Rowland started a small retail nursery in 1953. Son Michael Rowland became President of Rowland’s and expanded the company to include the wholesale division Plant World in 1990. Michael’s daughter Erica Rowland and son-in-law Mike Erickson joined the Plant World team as teenagers in 1998 and are now Vice President’s in charge of business operation. customers and the general public have the opportunity to join the Club and shop where the pro’s shop. Anyone can become a club member by opening an account either in person or on our website. Lifetime membership fee is $25 and allow the member to buy at wholesale prices, and take advantage of special buys throughout the year. We are so proud to be part of this community and very grateful to all of our patrons who are such an incredible part of our lives.